POW! Out of nowhere came a fist to the face that knocked the pastor off his feet in front of hundreds in the congregation. Reverend Billy Joe Daugherty was stunned for a moment, but in the midst of the mayhem he chose to forgive the unknown assailant and proceed. He returned to the pulpit and closed that morning's church service as blood ran down his face and onto the floor. 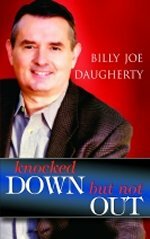 Knocked Down, But Not Out is a book about this incredible incident and what Billy Joe learned about himself, anger, forgiveness, and the goodness of God. Control your temper in the face of violence? Regain your composure as quickly as possible? Forgive the enemy you didn't know you had? Recognize the good in every situation? Lean on Scripture to give you strength? This is a book you cannot afford to miss. It will become a handbook and a lifesaver for everyday situations!